Back in October 2014, prior to my upcoming 2nd mountain climb to Mount Kinabalu on 28 October 2014, I’ve decided to bring my little sister for a day of cycling trip to the closest Island from Singapore – Pulau Ubin. An Island which is known to be like the ‘Olden Days of Singapore’ due to its untouched kampung lifestyle where you can still see houses made of zinc and wood and a totally laid back life where time seems to be ticking slower than when you are in Singapore. It is an Island known for activities such as cycling, trekking and just exploration to its Mangrove Swamp, food delicacies and campings. Invited by my high school classmate for this Pulau Ubin trip, both sis & me were looking forward for a great day getting out of Singapore. It’s my 3rd time and sis 1st time. 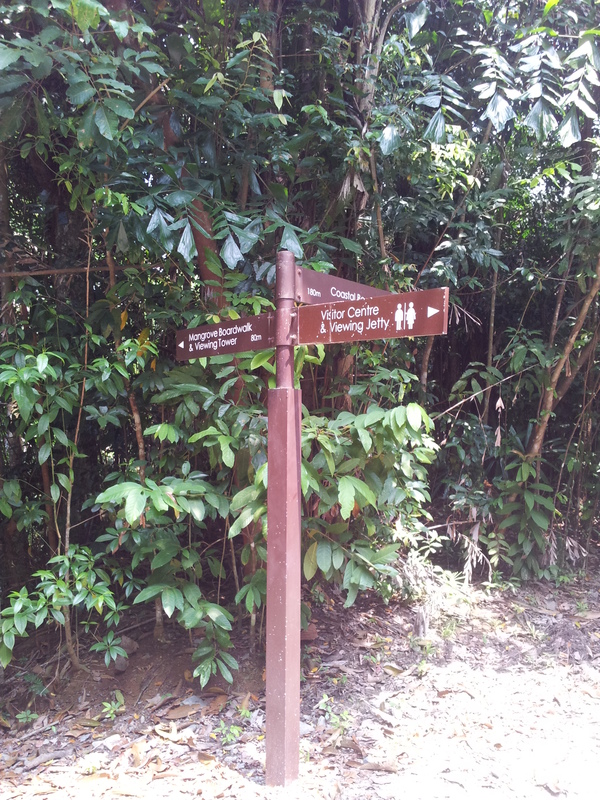 My advice is, always set off as early as you can to avoid crowds and so as to be able to explore Pulau Ubin in 1 full day. 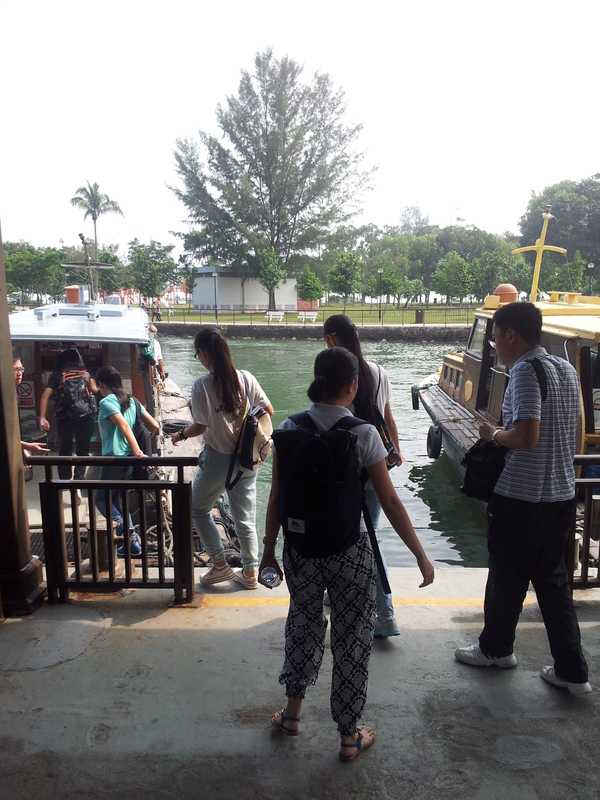 We met about 10.30am and there were already a great number of enthusiastic visitors, eagerly waiting to get on the bumboat for a little runaway. 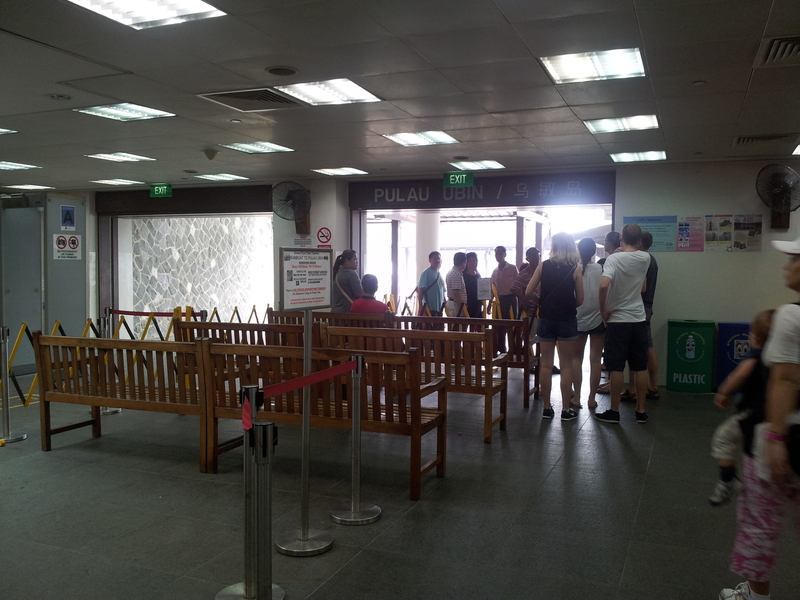 I love the view of Changi Point Ferry Terminal entrance which is made of stones architectural designs. I just love it! Here’s where you can alight or drop off if you take cab or car. 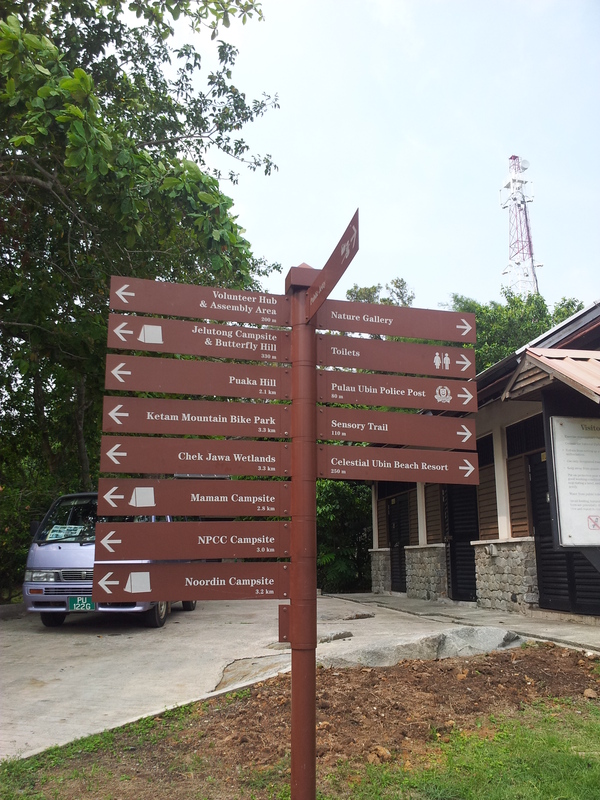 As you enter, you can see clear signboards to show you the directions to Pulau Ubin Bumboat. 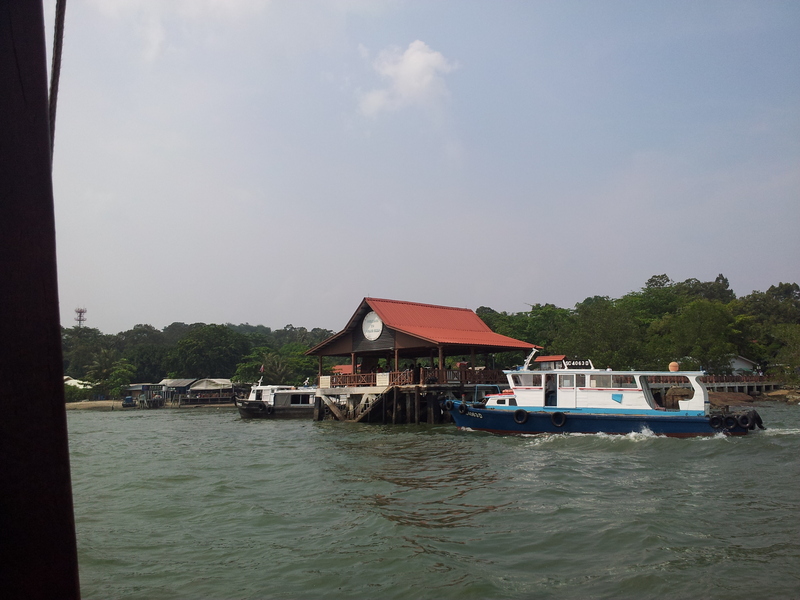 Changi Point Ferry Terminal also provides bumboats service to Pengerang in Johor. *Departure Timing is at the discretion of boat operator & boat availability. 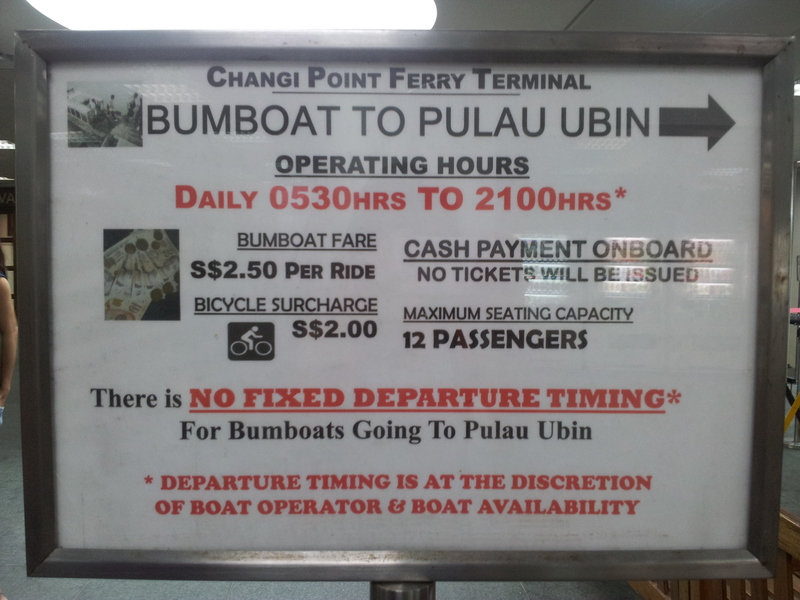 So please check the last bumboat departure time from Changi Point Ferry Terminal and from Pulau Ubin. All prices are for One Way. You can charter 1 full boat if you are in big groups or family of 12. This is how the queue looks like. 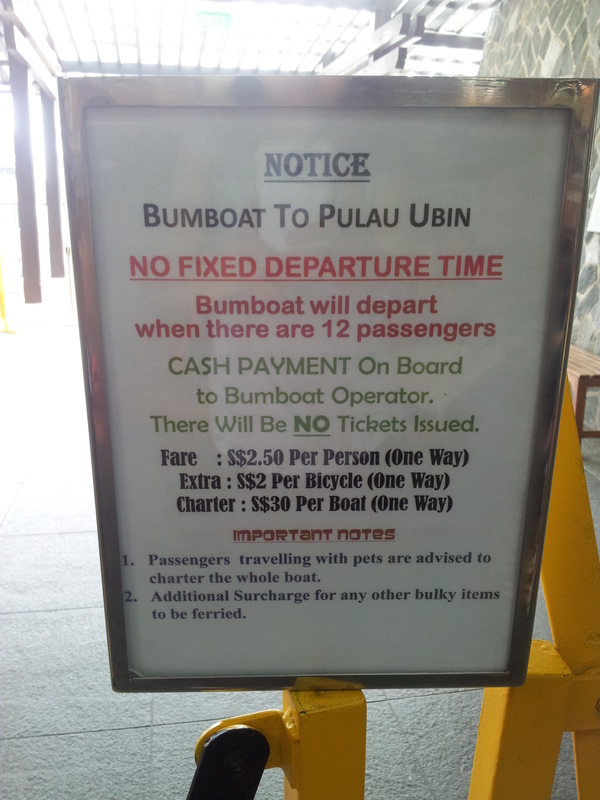 You’ll pay directly to the boat operator before you enter the bumboats. As long as there are 12 passengers on board, the boat will depart. But if there are less passengers, it will keep waiting till there are 12 people on board. I love sitting at the back of the boat where I could feel the wind and watch the Ferry Terminal getting further away as the boat drove off. The boat ride only takes about 10-15 minutes depending on the tide, waves and weather. It was such a great moment especially looking at my sister’s expression and face on her first ever boat trip. I felt a sense of accomplishment to be able to bring her out of Singapore and away from the gadgets that seems to be taking over the natural outdoor activities. After a short ride, here we are! The first thing we did upon alighting was to look for the best bicycle rental place. Walk to the left where you can see all of the bicycle shops and get your bikes! We walk around to search for the best option and finally got ours. Bicycle rental prices range from $6-$12 for a whole day usage depending on the type of bicycle you chose. 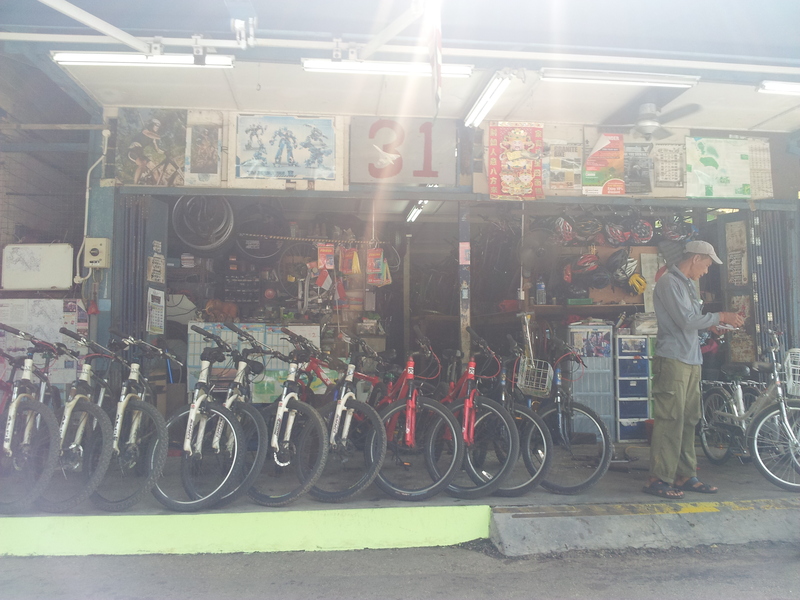 This is the shop where we rent our bicycles from. So far so good. Friendly uncle who allows me to change my faulty bicycle without any fuss and in fact, helped me to choose the better ones. 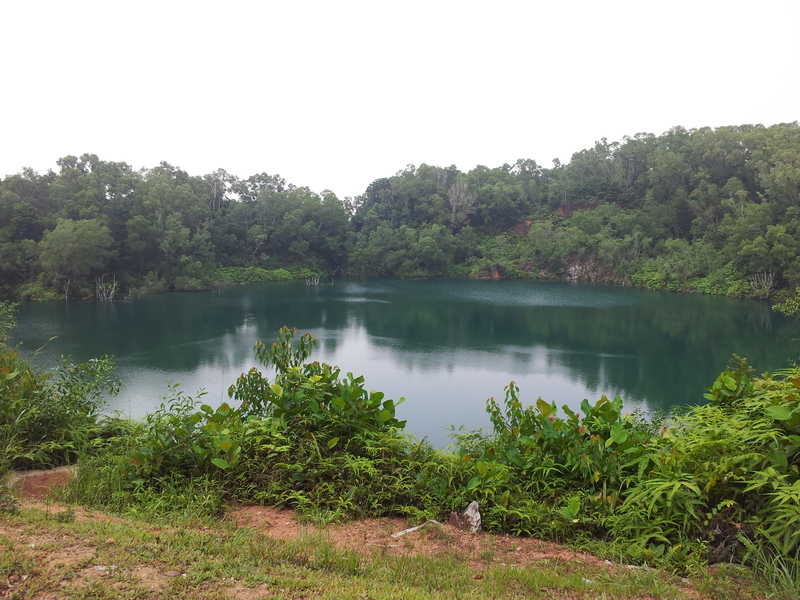 We start cycling and came across the first quarry called Pekan Quarry. It’s very green. Loving the greens around me here. 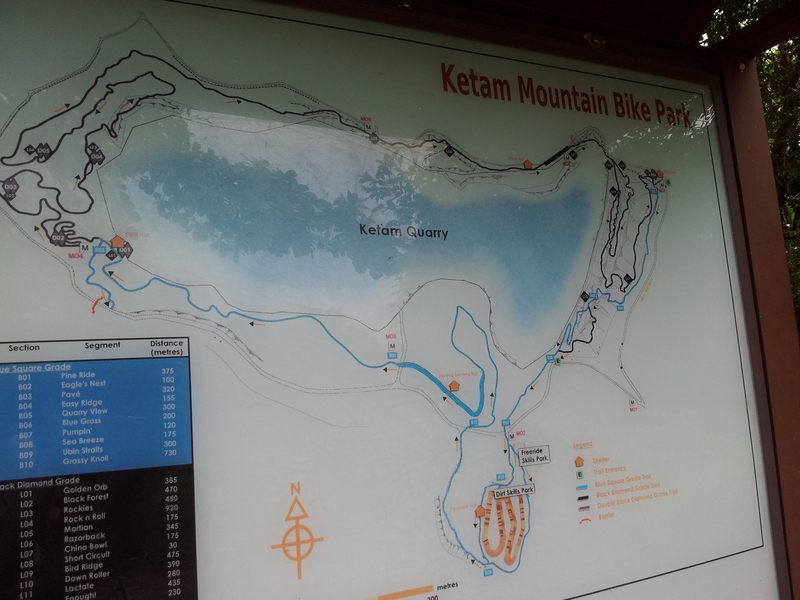 Then continue our journey to Pulau Ubin Ketam Mountain Bike Park. The experience cycling in this Pulau Ubin Ketam Mountain Bike Park is awesome! Recommended for kids but adult supervision is strongly advised due to the steep trails and dangerous path that may let you go right into the lake if you don’t break on time. So more for Medium to Advance cyclist if I were to be a strict judge. =) I was delighted that sister manage to complete this trail without much complains or sigh. Though she does encounter some difficulties like having to get off the bike and push it, she manage to get through it! I’m so proud of her! The trail we took was small, rocky and was covered with bushes around. We get to see Sungai Puaka while on the way to the Ketam Quarry. Here’s a shaky video of our little cycling adventure. Enjoy! 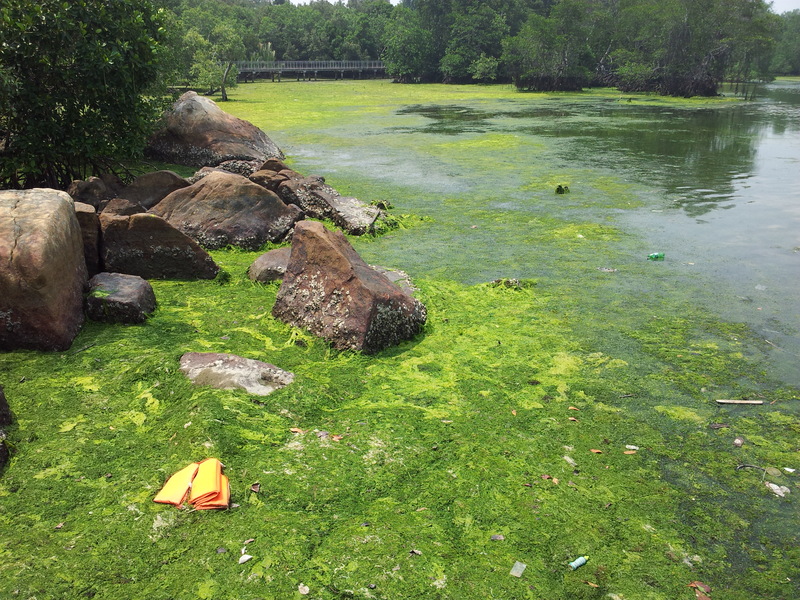 Next stop, Chek Jawa Wetlands! 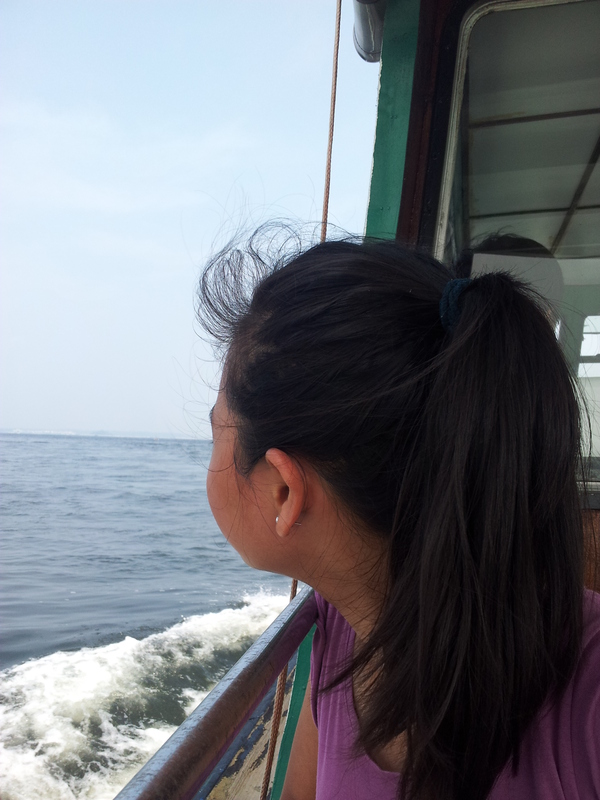 Here’s the view while on our way to Chek Jawa. We stopped by a pick-up van stall for a short break, gulping down coconut water from the juicy coconuts and plain water and H2O. Wow. Super refreshing! The trail to Chek Jawa may get a little too steep, so some of us actually had to get off the bike and push it up for awhile. Some skilled cyclist will be able to ride up with no problems at all! We parked our bikes near the Visitor Centre and get to observe a drama between the wild dogs of the area and 2 wild boars. The dogs were barking fiercely at the wild boars, chasing them away from the crowds. These wild dogs really do take care of its visitors. 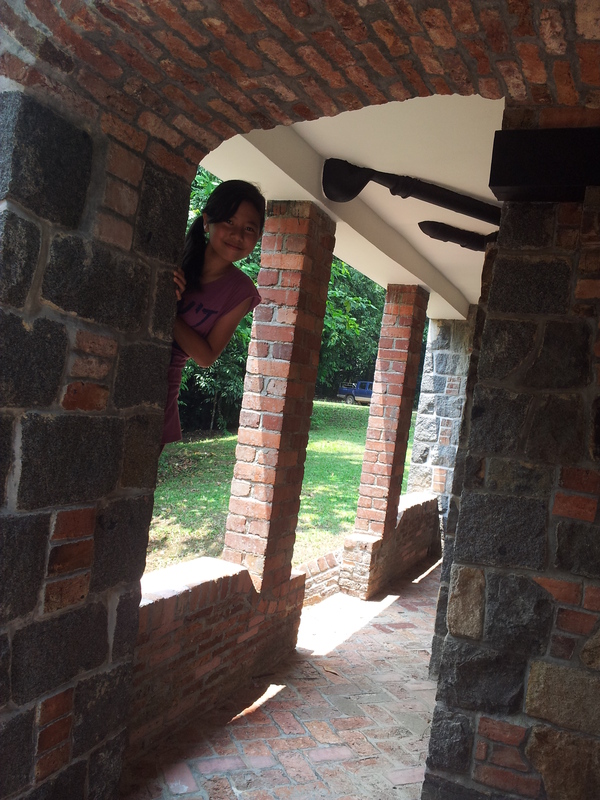 After a short walk, we reached Chek Jawa House No. 1. I was immensely intrigued by these brick house. It looks amazingly stunning! Great spot for photo taking! 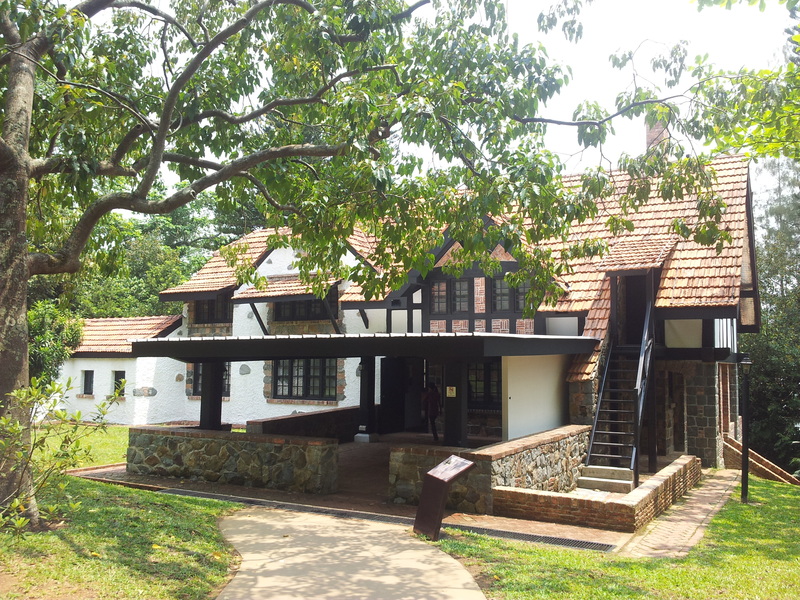 There are some interesting information and history of Pulau Ubin inside this Chek Jawa House No.1. If you want to know more about it, come on here and find out yourself! 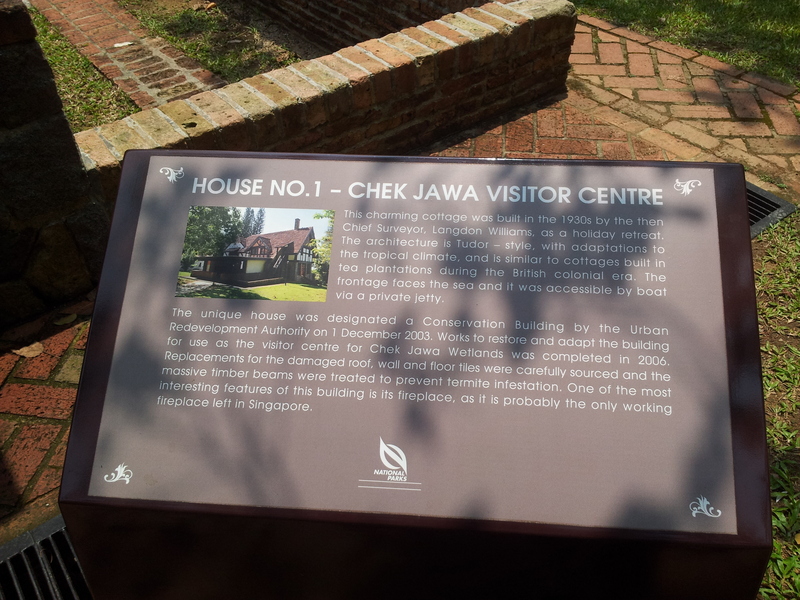 The back of Chek Jawa House No. 1 provides a Jetty for you to walk further up to have an overview of the house and to see Pulau Sekudu, famous for it’s forklore about a pig, an elephant and a frog. Next stop, the Chek Jawa Wetlands Mangrove Boardwalk. The perfect sunny weather makes the greens in this mangrove stands out looking great in my photos. Stunning. Sadly, we can see litter around when there’s a low tide. We came in via the Mangrove Boardwalk and out via the Coastal Boardwalk back to our bike parkings and proceed on to Balai Quarry. This is the amazing view we get to admire while taking a pit stop. Our stomach were growling and pleading for food. Because none of us brought along any food except for some light snacks which has been gobbled up earlier on, we decided to call it a day. It’s been a great cycling adventure for us. Tiring but worth every minute. Laughing and teasing one another, racing along the empty roads and just enjoying the view around us and doing people watching. 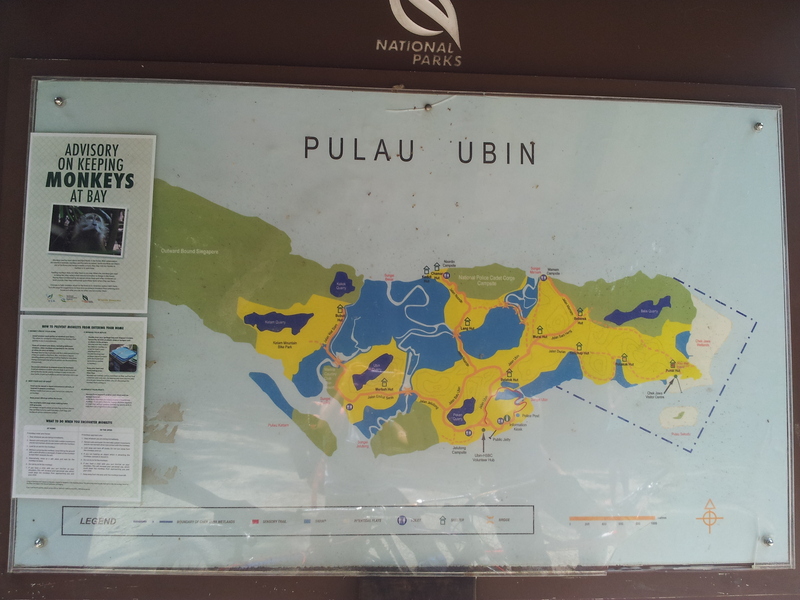 If you need to get away for a day, I urge you to come on down to Pulau Ubin! There’s a chalet and campsites too if you need to stay for a night. You can enjoy snorkeling, fish spa, eat seafood and just relax. Journey to Changi Point Ferry Terminal takes about approximately around 30mins. Click on the links provided to view the routes of each bus and plan your way! Hope you enjoy this post as much as I enjoy sharing it with you! Thank you. You could start a new career as a travel writer/photographer. A most informative and entertaining travelogue. 🙂 You’re very much welcome and thank you soo much too for your compliments. But you’re being too kind, I’m still far from being a photographer or writer. There’s still so much I have to learn.